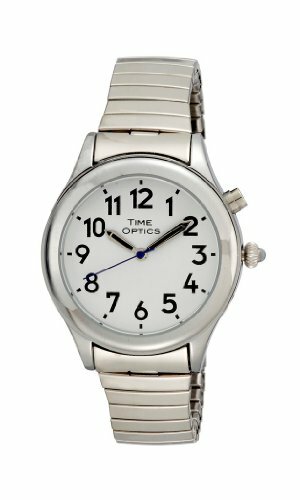 Ladies Silver Tone Dual Voice Talking Watch. While it has only one button, this watch announces the Time, Day, Date and Year, and has an Alarm. An easy to hear voice of either ladies or mens voice is easily set by the user. Very simple to set and even easier to use. The design is stylish so the flex band is tapered and the crown has a beautiful oversize pumpkin crown with cabochon.